The importance of the livery company maps of the Londonderry Plantation cannot be underestimated. 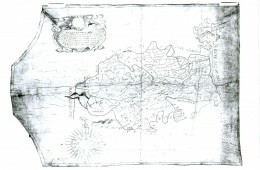 Dr Annaleigh Margey, Lecturer in History at Dundalk Institute of Technology, has been examining the maps of Ireland and its regions during the decades of plantation from 1550 to 1636 and takes a closer look at eight of these maps from the livery companies archives held by London Metropolitan Archives at Guildhall Library. While to modern viewers, they appear as basic drawings with little by way of modern cartographic expectation, the maps became fundamental tools in the development and shaping of plantation landscapes in Londonderry. In 2013, the City of Derry/Londonderry in Northern Ireland commemorated the 400th anniversary of its foundation and charter, granted under the auspices of plantation in Ulster. On its foundation, the city was envisaged as a fortified settlement that would bolster the security of a wider plantation in its hinterland. This plantation, known as the Londonderry Plantation, gave rise to the establishment of a new County Londonderry, formed from the former County Coleraine and part of north Tyrone. Two towns – Londonderry and Coleraine – were also founded. The newly formed the Honourable the Irish Society became overseers of the plantation, while the Twelve Great Livery Companies of the City of London each received twelve lots of the land of the new county to be managed, developed and financed from their company halls in London. Under the terms of their grants, the companies agreed to bring British settlers to, and remove native Irish from, their lands; to establish settlements; to pay rents; and to ensure the taking of the Oath of Supremacy by their settlers; among other regulations. In 1613, however, the individual livery companies knew little about the lands of Londonderry. Having been grudgingly enticed into the plantation, the companies became anxious to know more about the physical and cultural landscapes of their new lands. As a result, some individual companies began commissioning surveys and maps of their estates in the first decade of the plantation. Since 2001, I have been examining the maps that were made of Ireland and its regions during the decades of plantation from 1550 to 1636. This research has taken me to both public and private archives across Britain and Ireland, finding maps in places ranging from national collections, to stately homes, to an ensuite bathroom! As a result, I have now located 655 manuscript maps for the period. Plate 1: Worshipful Company of Merchant Taylors’ plan of ‘Macosquin’, possibly by Thomas Raven, c.1616 (LMA CLC/L/MD/F/016D/MS34100/134). Of these, an estimated 105 relate to the Londonderry Plantation. These are located in the library of Trinity College Dublin, the Public Record Office of Northern Ireland in Belfast, and Drapers’ Hall, Goldsmiths’ Hall, and Lambeth Palace Library in London. Eight of these maps, however, are held by London Metropolitan Archives and may be accessed at Guildhall Library in the City of London. These maps were deposited as part of the larger collections of the Worshipful Company of Merchant Taylors (CLC/L/MD/F/016E/MS34100/208 and CLC/L/MD/F/016D/MS34100/134), the Worshipful Company of Ironmongers (CLC/L/IB/H/002 and CLC/L/IB/G/097/MS17298) and the Worshipful Company of Fishmongers (LMA uncatalogued, formerly GL Folio 2, No. 8). All but one of the maps could be described as reconnaissance surveys of the estates of these companies as they sought to understand the geography of the new lands which had been granted to them. One map in the Merchant Taylors’ collection breaks this mould, giving an outline plan of the town of Macosquin (see Plate 1), which became the main settlement of the company in Londonderry. While the cartographers associated with a number of these maps cannot be identified, three mapmakers – Thomas Raven, Simon Kingsland and Thomas Croddin – all have surviving maps within this collection. Raven is perhaps the most well-known of these, having been the City’s surveyor in Londonderry during the early stages of the plantation. Kingsland has been noted as a book-keeper to the Livery Companies, while Croddin’s career as an estate surveyor spanned both sides of the Irish Sea (see Sarah Bendall, Dictionary of land surveyors and local map-makers of Great Britain and Ireland, c.1530-1850 (London, 1997), 122 and 297). Focusing on the maps of the Ironmongers’ Company gives something of an introduction to the content of these preliminary surveys. The most significant map within their collection is that titled ‘A Buttall of the Lands No 7 [lying] in the Baronj of Colraine belonging to the Worshipful the Company of Ironmongers’ (see Plate 2). The Company appeared anxious to obtain a map of their lands from their earliest dealings with their Irish estates. 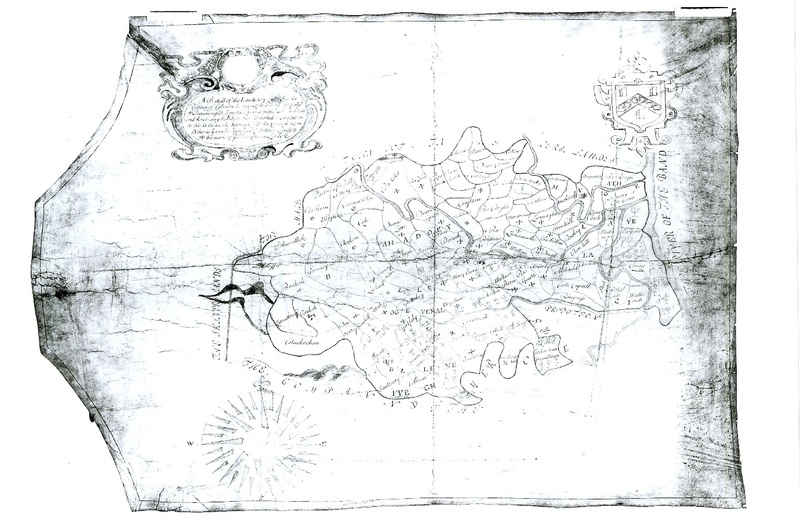 A request for a survey and map to be undertaken by Thomas Raven is noted in their Court Orders as early as February 1613 (CLC/L/IB/B/001/MS16967/003, f. 128v, February 1613). Raven, however, does not appear to have produced a map for the company, with much of the cartographic work on their estate attributed to Simon Kingsland. The surviving map measures approximately 774mm × 970mm; has a scale bar, which allows a modern estimated scale of 1:25,000 to be determined; and has a compass rose, with north above. The map also includes some basic embellishments such as a black line border, a decorative cartouche bearing its title and a coat-of-arms. In terms of its content, Kingsland very deftly outlined the extent of the Ironmongers’ lands in Londonderry, situating it within the context of the surrounding proportions belonging to the Skinners’, Mercers’ and Merchant Taylors’companies. Within the Ironmongers’ estate, he also provided a snapshot of the boundaries of townlands and churchlands, inscribing place names, many of which were drawn from their native Irish heritage. The physical landscape of the proportion was also laid bare, with a keen focus on the rivers, mountains and woods. Their presence, of course, did much to determine the viability of the company’s estate. Mountains, for example, had to be excluded from areas of potential settlement, while rivers were important in determining areas for agricultural production. In turn, woods offered the basic building blocks for their new settlement. Why are these maps important? 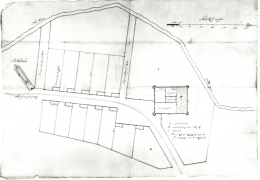 The importance of these maps from the Londonderry Plantation cannot be underestimated. While to modern viewers, they appear as basic drawings with little by way of modern cartographic expectation, they became fundamental tools in the development and shaping of plantation landscapes in Londonderry. It was their content, alongside written reports, that helped the livery companies, and other landlords, to reshape the landscape of Gaelic Ireland, moulding the lands into estates that were reminiscent of contemporary England. In turn, as the plantation took hold, they became monitoring tools for these changes, often showcasing the new developments, including the many villages and towns that became embedded in Londonderry’s landscape. Annaleigh Margey is a Lecturer in History at Dundalk Institute of Technology. Her book, Mapping Ireland, c.1550-1636: a catalogue of the manuscripts maps of early modern Ireland will be published in 2017 by the Irish Manuscripts Commission. Fascinating. I am tracking the Moores in Carrowreagh and Carrowclare and I think these townlands are in the area of the Ironmongers (plate 2). Can anyone verify this please? I am in Australia. Yes, Carrowreagh is in the Ironmongers’ proportion. Go to the Places index and click on Carrowreaghe which will take you to the folio within the Great Parchment Book where it is mentioned. Carrowclare does not appear in the index, but it borders Carrowreagh to the west so is close by. Unfortunately, I cannot see any Moores in the People index. Philippa, thankyou. I explored further and found no Moore in the Index and mention of Carroreaghe and am still reading through. 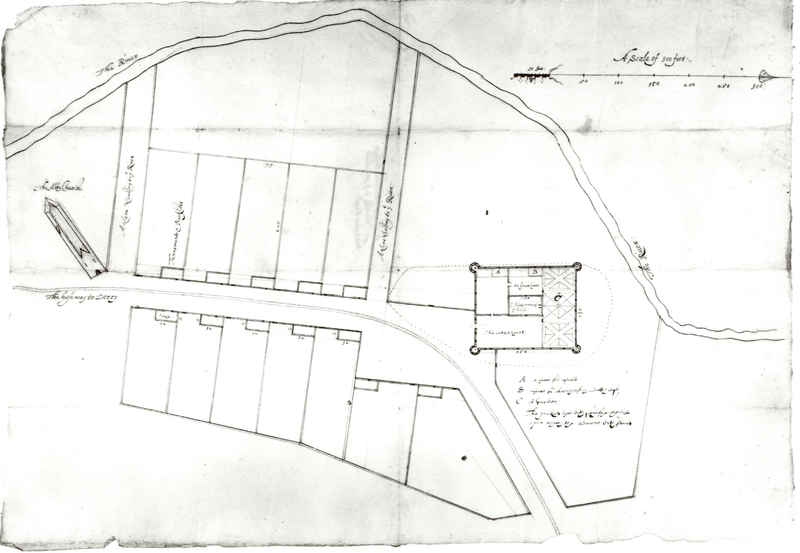 I have copies of 2 land documents – 1693 between George Philips and Thomas Moor for part of Carrowreagh, and 1700 between William Conolly and 3 Moores for half of Carrowreagh in the Manor of Limavady. Lots more research to do. Dear Marilyn, Moores have lived at Myroe (includes Carrowreagh) for the past 300 years and still do. A qualified genealogist is fionapegrum@gmail.com she lives in Limavady and gained her RG from Strathclyde. Stephen, great to hear from you. Since my 2016 post I have been working on my Moores in Carrowreagh and Carrowclare co Derry and have made great progress on working out their relationships from the 1600s to 1933 (last of the Griffiths Revisions) – mainly from land documents and Wills. My document is 107 pages and I am currently trying to clean it up and complete it. I would love to be able to contact any Moores still in the area and descended from the Moores of 1700s onwards. I visited Limavady in late 2016 and have the Moore pages of the local phone book – about 30 in the area – I might consider writing to some or placing an ad in a Limavady newspaper to try and find some. Do you know of any Moores in the area interested in their lineage? Thankyou for the name of the genealogist – I think I have collected nearly as much information available in records as possible and am at the stage of linking the people. Great to here from you Marilyn, i myself went to school with Moores from Myroe at Bellarena Primary which closes for good this summer. My email is stmccracken@hotmail.com. I am a member of the Limavady Historical society with two books on the area coming out this summer. These provide rent book info for Magilligan and Aghanloo going back to 1610, Myroe will come next year. Feel free to give me a mail. Does anyone know of maps or information on the areas allocated to the Mercers? A good starting point is the definitive history: Curl, J. S. (2000). The Honourable the Irish Society and the Plantation of Ulster, 1608-2000: the City of London and the colonisation of County Londonderry in the Province of Ulster in Ireland: a history and critique. Chichester, West Sussex: Phillimore. Available at Guildhall Library and London Metropolitan Archives.